Designing a kitchen has 2 main functions – creating a space that looks beautiful and but that is also very functional. Your kitchen is the hardest working room in the house after all! 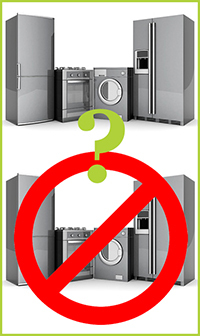 Your appliances are integral to this but should they be integrated? That’s quite a major decision that needs taking quite early on in the kitchen planning process. In this month’s Kitchen Trends Monthly Blog we’re looking at the pros and cons of integrated (ie built in and hidden behind doors) or free-standing appliances (visible in all their glory!). Free-standing appliances create a more ‘honest’ design. Everyone knows that you have washing machines and fridges and dishwashers in a kitchen so why hide them?! So, which is right for your kitchen? There is no right or wrong answer as everyone has different priorities and opinions. Hopefully the above check list will help you decide. Of course you could even go for a bit of both - a built-in oven at eye level and integrated washer and dryer and free-standing statement piece fridge freezer - if you want the best of both worlds! Too expensive to buy new appliances for your new kitchen? If you fancy integrated appliances but are worried about the cost or just fancy new ones to go with the new kitchen then the offer we currently have running may be of interest to you. Until 31st October we are offering all appliances – integrated or free-standing – at trade prices. This is a saving of up to 35% which can make your kitchen budget go a hell of a lot further! See the offer for more details but remember, you have to order your kitchen before the end of the month. Did we also say that if you order by the deadline you can also have your kitchen installed in time for Christmas? That’s not a bad thing either is it! 0 Responses to "Kitchen Trends Monthly Blog – October"